Draft Scottish Budget - read with care! If you are struggling with the different interpretations of the Scottish Government’s draft budget, don't panic, it is confusing! My briefing for UNISON branches attempts to cut through the spin and outline the impact on the services our members deliver. In this blog I will instead focus on a few key points. Firstly, this is a real budget, not just spending plans, because it includes the revenue raising powers. So we start with the block grant, which is being cut by 9% due to UK austerity plans between 2010-11 and 2019-20. However, in the coming year the Scottish Government has a little wriggle room because there is a small real terms increase in funding of £188m. The next two years are considerably tougher under current UK plans. Then you add in any of use the devolved tax powers. They have decided not to increase income tax, although not cutting tax for higher rate (40p) taxpayers should generate an additional £79m. Other devolved taxes on land transactions, landfill and aggregates, generate small additional revenues. Of course taxes can be reduced as well, and the budget confirms that they remain committed to a 50% cut in Air Passenger Duty - an unaffordable, environmentally damaging tax cut for the better off. Thankfully, not this year though because it would cost a massive £171m to implement. That's the same as this year's real term increase in NHS spending. The most confusing spin is over the local government budget allocation. I'm afraid when our branches sit down with their councils to discuss the budget, they will find that their director of finance doesn't recognise Derek Mackay's extra £240m. Unsurprisingly, the reality is somewhere in-between his spin and that of some councils. We should remember that the Scottish budget only determines the Scottish Government's allocation to councils - important though that is. There is a real terms cut in the local government (including grants) budget allocation of £327m. The Scottish Government argues that this is mitigated by the extra income from the council tax bands (£111m) and helpfully they have abandoned plans to expropriate that for their own priorities. While this shouldn’t appear in the Scottish budget, it is a real additional source of revenue, albeit one that will benefit better off councils with higher banded properties. Councils with disadvantaged communities will also have to fund the improvements to the council tax reduction scheme. The government then adds in the extra £107m coming from the NHS budget for social care. This won’t impress your finance director because it is for a specific additional commitment (contractors living wage) so won’t help to mitigate grant cuts. That's not to say that it isn't very welcome and desperately needed to help stave off a staffing crisis in social care. There are some other additional pots, but again these are ring-fenced. Yes, they did claim they would stop doing that! The government then gets very cheeky by assuming that councils will increase the council tax by the maximum 3% they are allowing - generating £70m of real extra revenue. Again, this is a matter for councils, who may reasonably point out that the government isn’t using its tax raising powers. The Scottish Government will not 'pass on austerity to the household budgets' with a national tax, but has an expectation that councils should do that locally. This looks like an exercise in political buck passing. Branches will also find that their finance director has a long list of unavoidable commitments that also don’t appear in Derek MacKay's calculations. Not least the cost of the UK Apprenticeship Levy that the Scottish Government appears to be pocketing the revenue from. Councils can reasonably argue that they have a good record in creating apprenticeships and should get this cash reimbursed. 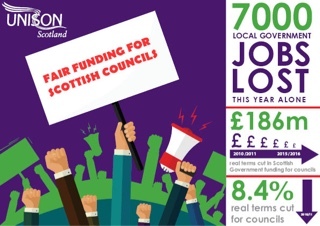 So, the bottom line is that councils are yet again facing the biggest budget cut. In fairness, there is some scope for mitigation, but nowhere near the spin the government is putting on the figures. We should also have a quick look at the health budget. Health boards get a cash increase of £321m, but that falls to £170m in real terms. The assumption is that inflation will be 1.5%, but health inflation is usually significantly higher. Health branches will also find their directors of finance are less than impressed by this figure. They also have unavoidable commitments including the Apprenticeship Levy. However, the biggest issue will be the £107m directed to integration authorities to pay for the increase in the living wage. This is very welcome and a justifiable priority, but it’s not NHS spending. It is blatant double counting to include this in NHS budgets and the local government finance order. Part of the problem with the 'Draft Budget' is that it isn't really a budget document at all. Most of the 186 pages set out a political narrative, which is not unreasonable, but adding in numbers that have nothing to do with the government's budget to spending tables, crosses a line for me. So read with care! The Scottish Government’s spending plans for 2017/18 is unlikely to be a cheery read when it's published on Thursday. However, when budgets are being cut, it is all the more important that government ensures that resources are not being wasted. A good example of this is set out today in a joint Guardian/Ferret investigation into the Scottish government’s NPD model of PPP schemes in Scotland. The report covers errors over interpreting EU rules which is expected to cost the Scottish government the equivalent of £932m in lost expenditure because it must now match the private finance spending under the NPD (PPP) programme with money borrowed from the Treasury. The scramble for matching funds is also expected to have knock-on effects on budgets. The investigation also found that the private consortium building Scotland’s largest NPD hospital in Dumfries is expected to generate £160m in interest and finance fees on loans totalling £242m, including the £212m spent on building the hospital. The consortium is charging an interest rate of 5.1% on borrowings of £218m. This results in the consortium earning more than £100m in interest payments from the public sector. It is also charging 11.3% on a further £24.2m in “subordinate debt”, which will earn financiers £37.5m in interest. If Scottish ministers had instead used public borrowing they would expect interest rates from the state-run national loans fund of about 1.6%. If government argues that their borrowing consent was insufficient, then a deal could have been done with the local council who can also borrow at this rate. A similar deal has been done by Northumbria Healthcare Foundation NHS Trust for its PPP contract at Hexham General Hospital, saving £67 million. This was funded by a loan from Northumberland County Council, which borrowed from the loans board. This is precisely what UNISON Scotland suggested over a year ago in our ‘Combating Austerity’ report. We calculated that the austerity cuts in Scotland could be wiped out by refinancing PPP schemes in this way. Sadly, progress has been at a snail’s pace with a handful of projects being examined. Ironically, we believe Dumfries hospital may be one of those. When jobs and services are being lost, it is absolutely vital that we chase every available saving. Effective monitoring, restructuring and refinancing PPP schemes are just some of the range of proposals we set out - and some authorities, to their credit, have acted on these. On PPP refinancing, it requires the Scottish government and their arms length agency the Scottish Futures Trust to take action. The scale and destination of the cuts to the Scottish Budget will become apparent with the publication of the Scottish government's spending plans on Thursday. This is not the time to cut taxes such as Air Passenger Duty. This is first Scottish budget with the full devolved fiscal powers in play. The Tories, despite voting for the new powers, don't want to use them. The SNP wants to use them a little. Labour, Liberals and Greens want to take a different course to Tory austerity, by making greater use of the powers. I may not agree with the Scottish government's cautious approach, but I understand the argument. A tax rise for most of us isn't likely to be popular, particularly when wages are depressed. However, railing against Tory austerity is simply not credible when you have the powers to take a different course and more importantly, you are actually cutting taxes for the better off. The proposed cut in Air Passenger Duty (APD) follows a consultation, which followed predictable battle lines. The airports and airlines think it is a wonderful idea and churn out nicely rounded claims on jobs and revenue. The environment lobby responds by pointing to the extra emissions the plan will pump into the atmosphere, damaging our already overheating planet. For me the case against a cut in APD has four pillars. Firstly, even if it had economic merit, we can't afford it. Today's Fraser of Allander Institute report lays bare the dire state of Scotland's public finances. This leaves Derek MacKay with few options. He will claim to be protecting the NHS budget, while awarding a 'fair' settlement to local government. Needless to say, this is impossible and is achieved through some cosmetic double counting of the social care budget. APD yields more than £300m to the Scottish Budget. That's a significant amount of revenue, more than half of last year's cut to the local government budget and the equivalent of more than half a penny on income tax. Even cutting it by half will result in significant cuts to jobs and services. Secondly, for a government that claims to be 'world leading' on climate change, this tax cut could have a damaging impact on the environment. The Scottish government's own analysis of a 50% cut in APD estimated a consequential increase in emissions of up to 60,000 tonnes CO2 per year. Air travel already accounts for 13% of Scottish greenhouse gas emissions from transport - a sector that has not contributed nearly enough to climate change action. Yes, we are making progress in reducing emissions in Scotland, but mostly on the back of the recession and the closure of Longannet power station. Thirdly, air travel already has a privileged tax position. Airfares are not subject to VAT and aviation fuel is tax-free. Implementing fuel duty at the same rate as private fuel tax would result in £5.7 billion of revenue at UK level, adding VAT to tickets would result in £4.0 billion, and the abolition of duty free would yield £0.4 billion. This means the aviation industry already benefits from an annual tax exemption of at least £10 billion, which amounts to around £1 billion lost to Scotland. In contrast, rail fares have been increasing at three times the rate of wages, for a service that many more of us rely on every day. Fourthly, this is a regressive tax proposal. Propensity to fly increases with income and socio-economic group, and 15% of the population of the UK take over 70% of all flights. Scotland’s lower income groups will achieve no or minimal benefit from a cut to APD, and higher earners (and corporations) will achieve a disproportionate benefit. No wonder the Tories have abandoned their manifesto commitment to oppose the APD cut! The Scottish government's spending plans are challenging enough without the additional burden of a cut in APD . It is simply unaffordable, damaging to the environment and provides more support to an already tax privileged sector. A tax cut for the better off is a strange priority for a government that claims to be opposed to austerity. A few months ago I wrote that federalism, a bit like my wardrobe, was coming back into fashion. Well, my wardrobe is still struggling, but yesterday Kez Dugdale took the journey towards federalism a step closer with her speech to the IPPR. Labour, at both Scottish and UK levels, faces a potential squeeze as voters take a binary position on constitutional issues - nationalist v unionist and/or Brexit v Remain. Complicated in Scotland by the significant cross over between these camps. Neither should be the focus of a socialist party, but the choice is to ignore it and hope politics as normal will return, or face up to reality and adopt a credible position. It is tempting just to say that the Scottish Government should get on with the day job, as Bill Jamieson does in a classic rant in today’s Scotsman. I could add that it is quite extraordinary that only one Bill has been introduced to the Scottish Parliament in the six months since the election. Nonetheless, we have to accept that voters are viewing issues through the prism of constitutional issues and as Labour’s own research shows, there is an appetite for a distinctive Labour position that is neither unionist nor nationalist. In Scotland, there has been some criticism that Scottish Labour hasn't articulated a position after the Scottish Parliament election strategy of ignoring the constitution failed. The Deputy Leader, Alex Rowley, has been promoting a discussion, but this is often wrongly branded as some sort of leadership challenge to Kez Dugdale. Anyone who knows Alex knows full well that this is absurd. Others such as the Red Paper Collective have also been articulating the case for progressive federalism. Yesterday, Kez attempted to set out the beginnings of a Scottish Labour response. This was deliberately done in London, which puts the initiative in the context of the U.K. Labour initiative, led by John Trickett MP, looking at power across the UK. This hasn't made the progress many of us would have wished, due to the entirely unnecessary and damaging distraction of the UK leadership contest this summer. This is important because whichever way we cut the constitutional powers, we have to address other power relationships. The power of corporations, the City of London, the growing wages gap and broader inequality. Scotland is not immune from these power structures, even under independence. A new Act of Union is a clever presentational way of addressing the issue, even if I can hear the groans from our law school professors! It also recognises that federalism in England, has to be a matter for those living in England. The UK is an asymmetric state which makes true federalism challenging. It’s why I personally prefer Home Rule, using its proper historical meaning. Brexit is an opportunity to rethink devolved powers. The Smith Commission focused on fiscal arrangements, but it was too timid on other powers. I was therefore particularly pleased to see the commitment to devolving employment rights, something that has broad trade union support in Scotland. I am personally open to a range of constitutional options in response to Brexit and the wider political crisis. Home Rule or federalism is certainly one of those and deserves to be properly articulated. It might also encourage those who support other solutions to up their game. Yesterday, Kez signposted a way forward for that debate and the initiative should be welcomed as part of new political strategy. For those who point to gaps, I would say it was a speech, not a policy document. This approach also leaves room for a detailed discussion in the run up to next year’s party conference. If you read anything about pensions this year, you should include the recently published Financial Conduct Authority (FCA) interim report on the asset management market. It may not be the easiest read, but it shines a light on why we get such poor value for money from our pensions in the UK. OK, I don’t expect you to read all 206 pages! There is an executive summary. It should certainly be required reading for pension trustees and in the SLGPS, pension board and committee members. It confirms what UNISON has been shouting about for some time – we need much greater transparency over the real cost of using investment managers. The UK’s asset management industry is massive. It manages £6.9 trillion of assets. Over £1 trillion for individual investors in the UK and £3 trillion on behalf of UK pension funds and other institutional investors. The service offered to investors comprises a search for return, risk management and administration – although it is the investor that bears virtually all the risk. Over three quarters of UK households with occupational or personal pensions use these services, including over 10.2 million saving for their retirement through pension schemes. There are also around 11 million savers with investment products such as stocks and shares ISAs. There will be very few UNISON members who are not touched by this industry, although most will probably have never heard of it. More importantly, they will have little idea how much of their hard earned cash goes to the industry. The report states that asset management firms have consistently earned substantial profits with an average profit margin of 36%! These margins are even higher if the profit sharing element of staff remuneration is included. The saying ‘we are in the wrong job’ has a whole new meaning! This is something the LGPS has been addressing through its transparency code and the Scottish LGPS has issued guidance to funds in Scotland to adopt the code. However, its still only voluntary at present and measurable outcomes are some way ahead. The drive for transparency is not as present on the retail side with only half of investors even aware if they are paying charges. One of my colleagues likes to illustrate this issue using a fridge analogy. If you buy a fridge you can compare the marked price. But the real comparison should include, energy use, delivery charges, warranties and much more. Very few of these charges are transparent when it comes to asset management. More of us will be familiar with the investment disclaimer, "past performance is no guarantee of future returns". The FCA report highlights the reasons for this. Funds measure performance over different time periods and there is a practice of merging poorly performing funds, “giving investors the false impression that there are few poorly performing funds on the market”. Even those who do outperform don’t continue to outperform the relevant market index or peer group for more than a few years. Pension trustees are often sold active investment strategies on the grounds that they deliver higher returns than passive funds that track an index. In the UK the split is around 20% passive to 80% active, whereas in the USA the split is closer to 50:50. 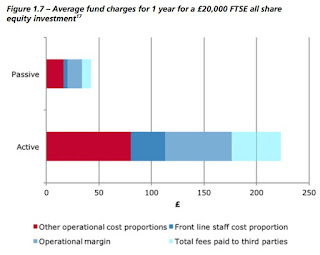 However, the evidence in the FCA report suggests that actively managed investments do not outperform their benchmark after costs. And the costs of active investments are significantly higher than passive investments as this chart from the report shows. Charges have also have remained stable, unlike charges for passive investments, which have been falling. The FCA suggests that this reflects competitive pressures and unwillingness in the active fund market to undercut each other. Weak pressure on prices can lead to weak cost control. The FCA report is particularly scathing about the role of investment consultants, with 60% of the market controlled by three firms. For example, they found that investment consultants accept hospitality from asset managers, suggesting a further conflict of interest and could result in poor outcomes for end investors. They are considering a market investigation reference to the Competition and Markets Authority (CMA). The report concludes with a number of very welcome interim proposals on remedies – not least on transparency and all-in fees. However, this is a hugely powerful and profitable industry and they will be lobbying hard to water down any action. It’s up to us to reclaim our pension funds for the workers who rely on them.